When it comes to a casual dinnerware set, choices are abundant. In choosing one, there are several things to consider. First, you will want your dinnerware to coordinate with your décor. Second, you need to decide if you are going to use it short-term or long-term. Third, consider the budget that is allowed for it, and fourth, determine the best quality that you can afford. If you intend to use the dinnerware long-term, it is best to look for porcelain sets as they are more resilient than ceramic or stoneware. In most cases, they are a bit more expensive. 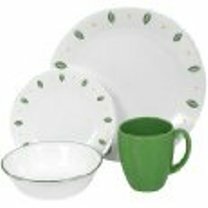 Another option for long-term dinnerware is a Corelle dinnerware set. Although it is glass dinnerware, the way that it is made makes it incredibly durable. Casual porcelain dinnerware sets are closely related to fine china dinnerware sets without all the frills of metallic trim, which makes fine china require special care. In casual sets, porcelain is at the top of chain when it comes to durability. There are many patterns available, so you can easily match your décor and they are ideal for everyday use. Browse the selection of casual porcelain dinnerware sets that are available. You will be amazed. Corelle dinnerware sets are outstanding. My aunt has been using a set as everyday dinnerware for as long as I can remember. It still looks gorgeous. No fading colors, chips or cracks, and she's been using well over 20 years. Corelle dinnerware is actually glass dinnerware, but the way that it is manufactured makes it very strong. It is break and chip resistant, lightweight, stackable, microwave safe, dishwasher safe, and the patterns are fade resistant. Moreover, the price of a set is beyond reasonable, especially for long-lasting dinnerware. Take a look at the patterns that are available in Corelle dinnerware . Square dinnerware sets are also available in modern patterns. Stoneware dinnerware sets are next in line when it comes to quality. In my observance, this is the material used in most homes for a casual dinnerware set that is used daily. The patterns that are available in stoneware are numerous. Honestly, you really can match any décor without going plain-Jane with your dinnerware choices. If you are in this budget category, take a look at the endless patterns that are available in stoneware dinnerware sets . There are many other options of dinnerware which might be ideal for your décor preference. These options include pottery dinnerware, ceramic dinnerware and earthenware. Choosing a casual dinnerware set can be a chore, but it is so worth the effort of looking for a set that you will love, that is useful, and that will last.